This weeks chapter is one of speculation and imagination in regards to an aquatint in my collection. It is a portrait of a man who was the inspiration for a very famous fictitious character known around the world. I believe my research to be correct so here we have #JosephBell. 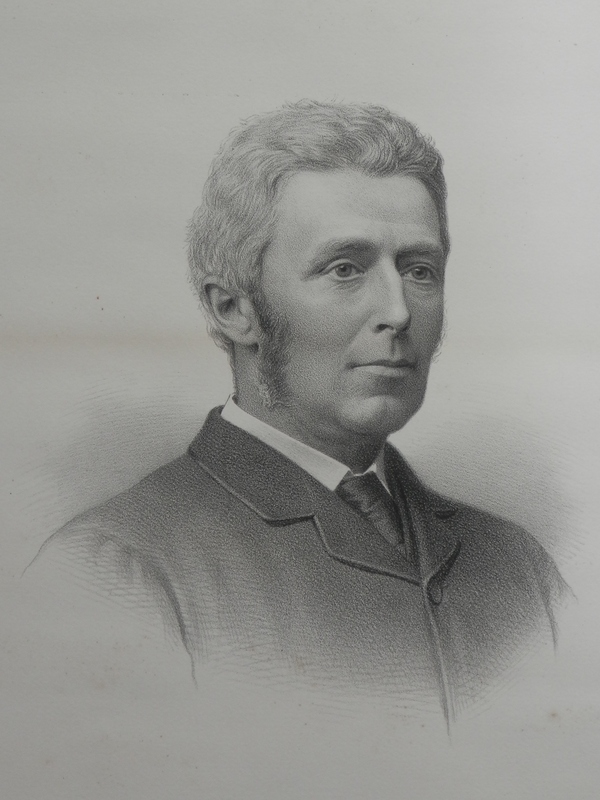 Dr. Joseph Bell was a Scottish lecturer at the medical school of the University of Edinburgh in the 19th century. He is perhaps best known as the inspiration for the literary character #SherlockHolmes. #ArthurConanDoyle served as a clerk in the Edinburgh Royal Infirmary under him. Bell was famous for making deductions about his patients and others whom he met. Supposedly, he was never wrong. He used his observations and skills in his lecturing also. Ten years after their first meeting Bell was on paper as an energetic eccentric detective with extraordinary skills in logic and deduction. Sherlock’s way of thinking and physique were reminiscent of the professor. Holmes also possessed the same gait, narrow nose, grey eyes, angled chin and high forehead. Holmes was also attired in the same way as Dr. Bell. He wore the deer-stalker cap and the long caped coat. It is said that Dr. Bell investigated one of the most famous villains of all time – ‘Jack the Ripper’ – killer of prostitutes. Dr. Bell investigated for a week and named a suspect in his notes – they have since been lost so whether he was correct in his assumptions or not we do not know. Even recently speculation in regards to the Rippers identity continued using DNA testing. This aquatint is odd in that the missive at the bottom is actually by Joseph Bell which means that he gave this image of himself to somebody. Signed in ink. 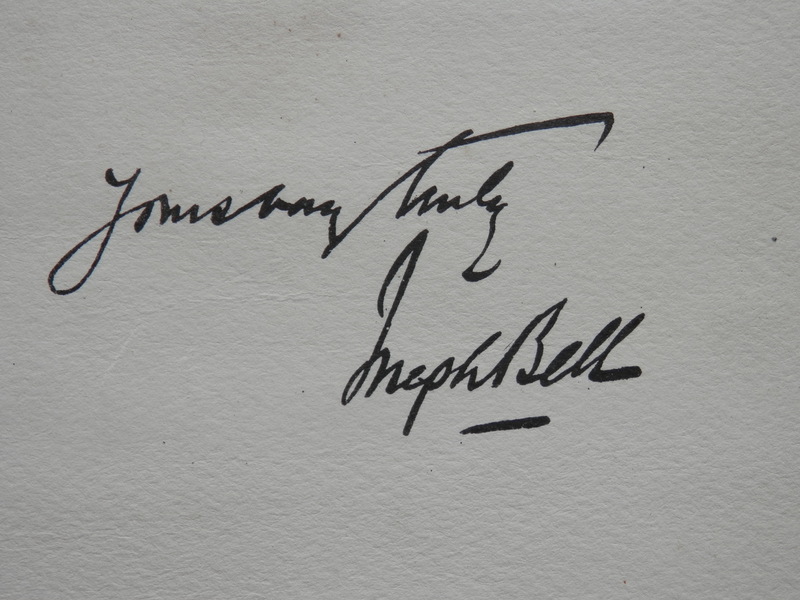 It reads ‘Yours Very Truly – Joseph Bell’. A lovely aquatint with the image of a very famous person both real and fictitious. This entry was posted in Aquatint and tagged doctor, Dr. Joseph Bell, investigations, medicine, portrait, sherlock holmes, signature. Bookmark the permalink. I have come across your blog while doing some research into the early 20th century prints that were issued by Bovril coupons. You did a blog about Bovril Art in 2013. My grandfather and his sisters were the children in a number of paintings by Isaac Snowman that were copied by Bovril for their coupon series. The prints include: Leopard Skin, Children’s Hour and The Wee Hostess. Snowman was living in Hamstead close by to my family when he did the paintings. Family members have prints of the series. As family history tells it the originals of the paintings were in the Bovril Head Office that was bombed in WWII and were destroyed. It seems you have other Bovril prints but not those of my family. If you know where I can get a catalog of the Bovril prints, or find out more about the coupon series, it would be great to hear from you. nor have found much information regarding the set.